With the exciting news that Julie Bell, the Region Chief Commissioner for North West England, has been appointed as the Deputy Chief Guide, Girlguiding Manchester leader Mel Price has now taken on the role of Chief Commissioner. Mel is a senior section leader running a monthly residential unit. 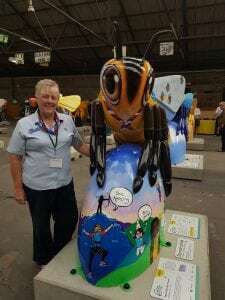 Mel was the County Commissioner for Manchester before taking on the role of Deputy Chief Commissioner for the North West England region in 2014. Mel will take on responsibility for leading the region, with Bekky Ashmore remaining as her Deputy. Together they will oversee operations in the region and input to national policy and strategy through to March next year when their terms of office end. Girlguiding Manchester is very proud that Mel is taking on this role and wish her every success as she continues the great work the team have been doing.